Author: Bauder, Kevin, Mohler, R. Albert Jr., Olson, Roger, Stackhouse, John Jr. This new and interesting volume in the Counterpoints series includes a section on Fundamentalism by Kevin Bauder, past president and current research professor at Central Seminary in Minneapolis. It is not often that a real fundamentalist is asked to participate in this kind of format. Kevin, my personal friend and past classmate, does not disappoint though I am personally wanting to pull his comments even farther to the right when it comes to fellowship with conservative evangelicals like Albert Mohler and Mark Dever. 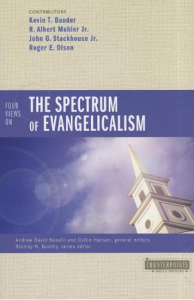 However, given the “spectrum” of writers in this volume, as a reader, I was cheering every time Kevin came “up to bat.” Kevin faithfully proclaims our fundamentalist emphasis on separation and biblical doctrine. Neither is there any shying away from secondary separation in the sense of fundamentalists separating from evangelicals specifically because they would not separate from known apostates. Billy Graham is the twentieth century example of this error. According to Bauder, 2 John 7 teaches that when believers commend apostates, “The evil of apostasy becomes common property between them and the apostates.” In my opinion, Kevin’s retort to John Stackhouse’s “Generic Evangelicalism” is the best section in the book.